*NOTE: This file is an EPUB, for iPad and iPhone. If you would prefer a Kindle file, please click the link to Amazon. There's a war underway in Canada, one that could change the course of a nation and a planet. The ambitious $5.5. billion Enbridge Northern Gateway pipeline proposal, if approved, will give Alberta further incentive to expand development of its oil sands, which scientists say will trigger catastrophic climate change. The award-winning team from the Vancouver Observer, winners of the Canadian Journalism Foundation's 2012 Award for excellence in journalism, has spent hundreds of hours reporting on the pipeline issue and capturing peoples' voices. 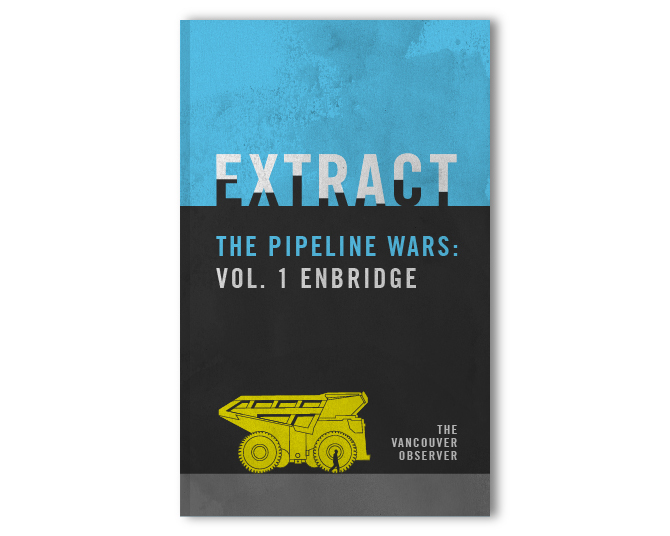 Extract: The Pipeline Wars Vol. 1 Enbridge takes readers into First Nations' communities amid wild landscapes of Northern British Columbia; it navigates readers through the web of pipeline politics, through crowded streets filled with protesters, and behind closed doors at an oil and gas export summit. This book is essential reading for anyone who wishes to understand the complicated situation facing Canada's oil exports today.